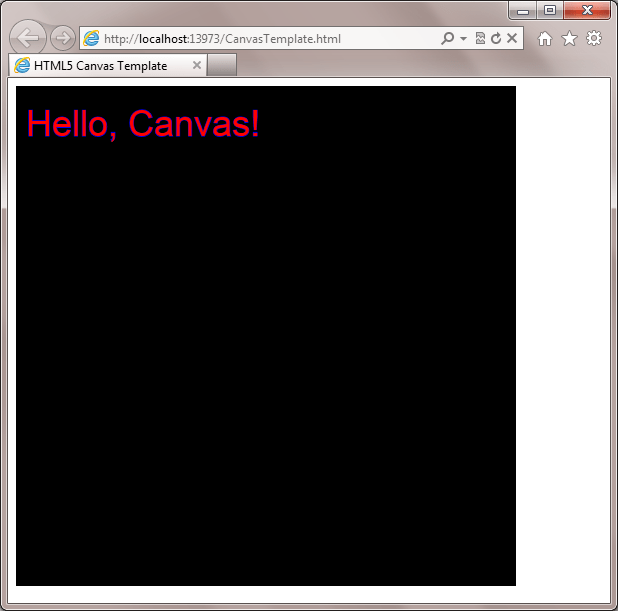 In this post, I’m going to begin an examination of one of the hottest new features of HTML5, namely the Canvas element. OK, we’re done. Let’s go home. Of course, it’s not that easy. By adding the canvas element to the markup, if we browse the page containing the element in a modern browser that supports canvas (you can find out which browsers support canvas using caniuse.com), you’ll see a great big nothing. Why? Because all that the <canvas> tag gives you is a blank slate, and unless you’ve changed the background color of your page, both the page background and the canvas will be white. Not terribly interesting to look at, so I’ll spare you the screen shot of the blank canvas. Just take my word that the above markup gives you a drawing surface that is 500 pixels wide by 500 pixels tall, and (assuming it’s the only element in the body of your page) will appear at the top left of your page. On line 7, I’m setting up a <style> block where we’ll put CSS rules. On line 13, I’ve added some content in between the <canvas> and </canvas> tags. Any browser that does not support Canvas will ignore the canvas tags, and will instead render the content within them. In this case, I’m simply displaying a message, but I could also provide a fallback solution using Silverlight or Flash, if I chose. On line 18, I am telling jQuery to execute an anonymous function when the page is ready for scripting, using jQuery’s built-in ready event. This is where I kick off processing, first getting a reference to the canvas element and its 2d drawing context (more on this in a bit), and calling the renderContent function, which is currently empty. It’s important to note that JsFiddle is an alpha release as of this writing, and I’ve found a few issues when editing scripts, particularly when using tabs. But overall, it’s very functional, and quite convenient for brief forays into web monkeying. For deeper development, I definitely prefer an environment like WebMatrix or Visual Studio that provide a more robust editing experience. Note that in the snippet above, I’ve already gotten a reference to the canvas element (you’ll see how momentarily), and I’m passing in the string argument “2d” to the function. This is required, although in the current specification, there is only one drawing context, which is 2d (there may be a 3d context in future versions of the specification, which is why you have to specify 2d, even though it’s the only context). It is this context that exposes all of the functions you’ll call to draw on your canvas. In the first line, I ask jQuery for the element with the id of “myCanvas” and call .get(0) to get the underlying element (by default, jQuery returns a set of elements wrapped with some of its useful functionality…but we just need the element itself), then in the second line I grab the canvas drawing context and stick it into a variable called, appropriately enough, “context”. In our template above, I define and populate these variables at the beginning of the anonymous function called by jQuery’s ready event handler. Since the renderContent function is also defined within the anonymous function, it will have access to the canvas and context variables, while keeping both the variables and function from polluting the global namespace (that is, unintentionally exposing variables and/or functions as global to the page). 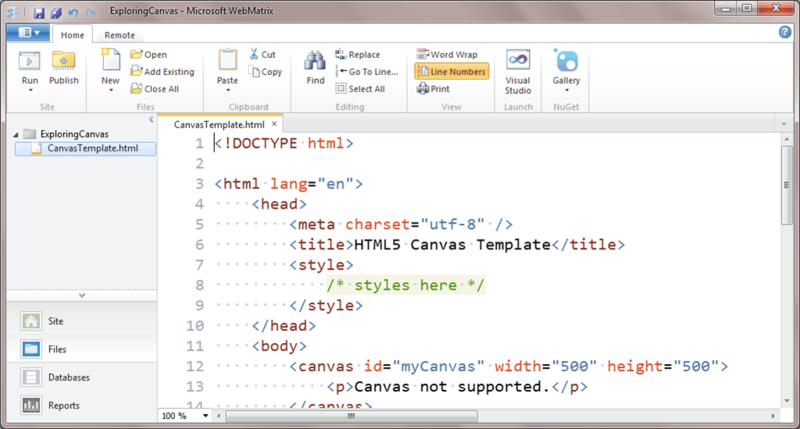 Hope you enjoyed the first installment of Exploring HTML5 Canvas. Glad you like it. Let me look into your question…I don’t know the answer off the top of my head, but I’m more than willing to experiment, and include that in my series. just prior to the closing *tag*, rather. I think perhaps part of your comment got cut off…I’d be interested in knowing what you had to say, if you’d like to submit it again. Look for the words “just prior to”. What follows is slightly inaccurate. Ah! I see now. Corrected. Thanks for the heads-up.